Editor's Note: I am not endorsing this person by printing her request here. I am merely passing along the information! I hand paint leather patches and wondered if you had any interest in seeing my work. Single pieces or multiple orders...top quality and priced right to you for resale if there is a way you could use my services. 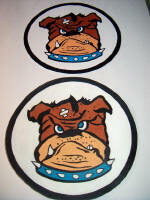 Or see the attached samples painted from decals provided me. Feel free to contact me with any questions or a quote. I wanted to say hello. I have been doing research on my Dad's flying in the Pacific during WWII. I would love to get more information about the remaining members from that era. If you knew anyone from this crew, please let us know! Barbara, just a quick note to let you know of a squadron postcard available for sale on EBAY. 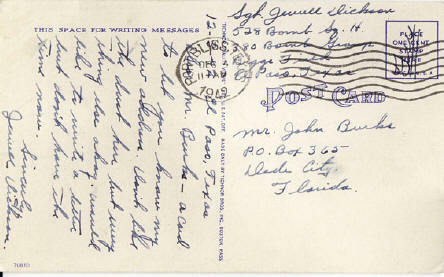 Search for "WW2 Postcard from 528th Bomb Squadron El Paso TX". 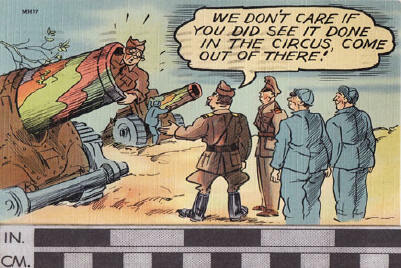 Looks like the postcard is from SGT Dickson. Don't know of any value to the SGT or his family, would you please let them know of this if you are able. Got interested recently when my wife (Laurie) received some of her Grandfather's - Ed Pennington 528th SQ 380BG treasures. I have been unable to find which aircraft Locke's crew flew in, nor have I been able to find any photos of him or the crew he was part of. I'm still searching through the website looking for a mention or photo, I keep getting distracted reading the stories and letters. I have looked for the books online, and found they are very expensive. I've tried my local libraries, they don't appear to have any in the catalog. Do you currently have any of the 380th BG books? My uncle, Alberth Thomas Goga, was in the 528th Squadron, 380th Bomb Group as an aerial photographer. I am writing on his behalf as he can no longer use a PC. On my last visit with him, he expressed an interest in some information about the 380th. Perhaps you may be of assistance. He wants to contact his former pilot, Leland Flint, and Frank Preston who got him transferred into the 380th. Do you have contact information for these two persons? (and also let Barb Gotham know). Thanks!